Allpresan Pedicare Anti-Fungal Foot Treatment is a two part treatment system used to control nail fungus. It consists of two products: Allpresan Pedicare Nail Tincture and Allpresan Anti-Fungal Cream Foam. Allpresan is two part care system. Nail Tincture – Shake can well. Spray end of nail with a small squirt underneath the nail twice daily. Anti-Fungal Cream Foam – Shake can well. Spray nail and surrounding areas with a small amount of foam twice daily. Allpresan Pedicare Nail Tincture is $19 for a little over a one and a half ounce can which is approximately a one month supply. Allpresan Anti-Fungal Cream Foam is $27 for a four ounce can and is approximately a one month supply. Therefore, a one month supply for this treatment is $46.00. Allpresan Pedicare Anti-Fungal Foot Treatment System does not have a money-back guarantee. There are no known side effects for this product. However, you may experience redness, itching and swelling at the application site. 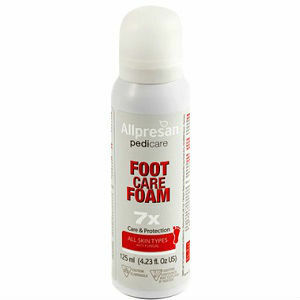 The Allpresan Pedicare Anti-Fungal Foot Treatment is a two part solution aiding in the healing of Nail Fungus. At $46 per month supply and no money-back guarantee, this treatment is a pricey one that could take several months to show improvement in your nail fungus. Jack Stevens	reviewed Allpresan Pedicare	on January 6th	 and gave it a rating of 3.